A Microwear analysis of recycled lithic artefacts from late Pottery Neolithic Wadi Rabah and Early Bronze Age layers at Ein-Zippori, Israel included cores-on-flakes (COFs) which are discarded blanks made into cores, and the flakes detached from them. COFs may have microwear traces that formed before they were recycled. The focus here is on how blanks removed from recycled COFs were used. Discarded flakes were not used as cores to produce small blanks at Ein-Zippori because lithic raw material was scarce, but were COFs recycled so that small tools could be produced for specific tasks? Visible wear traces were present on 19 of 44 blanks produced from COFs. Microwear traces were similar to use wear Lemorini et al. (2015) observed on much older Lower Paleolithic recycled flakes from Qesem Cave, Israel. Most flakes struck from COFs had been used to cut and scrape meat and fresh hide (42%, n=8), but four were used to work wood (21%) and four others were used to cut, scrape, or whittle bone and wood (21%), and two were used for butchering and wood working (11%). One flake only had generic weak microwear traces (5%). These were expedient flake tools, made and used in an ad hoc fashion. Specific blanks do not seem to have been used for distinct tasks. Prehistoric Archaeologist currently working in Albania, Hungary, Israel, and the USA. Prevous research in Cyprus, greece, and Eygpt. Microwear analyst. Andrefsky, W., Jr. 1998. Lithics: Macroscopic approaches to analysis. Cambridge University Press, Cambridge, 258 p.
van Gijn, A. L. 1990. The Wear and Tear of Flint: Principles of Microwear Analysis Applied to Dutch Neolithic Assemblages. Analecta Praehistorica Leidensia Vol. 22, University of Leiden, Leiden, 182 p.
van Gijn, A. 2010, Flint in Focus: Lithic Biographies in the Neolithic and Bronze Age. Sidestone Press, Leiden, 289 p.
Johnson, J. K., 1981, Lithic Procurement and Utilization Trajectories: Analysis, Yellow Creek Nuclear Power Plant Site, Tishomingo County, Mississippi, Vol. 2. Archaeological Papers, Center for Archaeological Research 1, University of Mississippi, and TVA Publications in Anthropology Vol. 28, University of Mississippi, Mississippi, 347 p.
Longo, L., & Skakun, N., (Eds. ), 2008, “Prehistoric Technology” 40 Years Later: Functional Studies and the Russian Legacy. Oxford, BAR International Series Vol. S1783, Oxford: Oxbow, Oxford, 559 p.
Purdy, B. A., 1975, Fractures for the archaeologists. 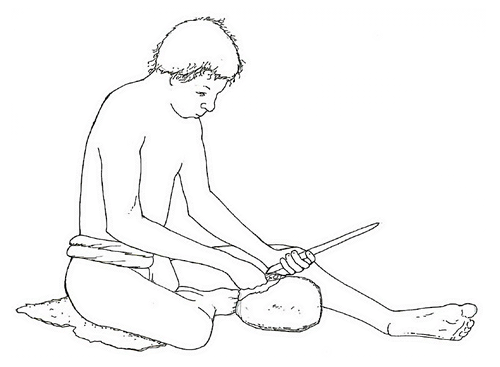 In: Lithic Technology: Making and Using Stone Tools (Swanson, E., Ed. ), Aldine, Chicago: p. 133-141. Rots, V. 2010, Prehension and Hafting Traces on Flint Tools. Leuven University Press, Leuven, 298 p.
Semenov, S.A. 1964, Prehistoric Technology. Barnes and Noble, New York, 211 p.
Shifroni, A. & Ronen, A. 2000, The “Tabun Snap” fron the Yabrudian/Acheulean Interface at Tabun. Praehistoria (International Prehistory Journal of the University of Miskolc, Hungary), 1: 109-116.